Outdoor Stone Pedestal Drinking Fountains Are Used Around The World! Concrete outdoor drinking fountains are made of pre-cast concrete with lead free components including stainless steel receptor, access doors and mounting brackets to provide weather proof and corrosion resistance that's great for outdoor applications. Outdoor drinking fountains include vandal resistant screws and double bubbler projector with chrome plated exposed fittings for theft protection and an attractive finish. Smooth, contoured basins with rounded corners and edges helps reduce splatter, ensure proper drainage and prevent standing waste water. Concrete drinking fountains are easy-to-clean and have beveled edges and corners for safety. ADA Accessible Drinking Fountains without barriers are available. Dual Drinking Fountain includes a side faucet to accept up to 2 users at once. Freeze Resistant Drinking Fountains feature a resistant valve system designed for ground installation 18 below the frost line. Includes 60" of access tubing. Freeze resistant fountains prevent frost or frozen water in colder climates. 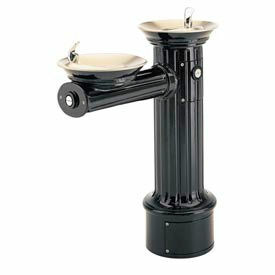 Optional Hose Bib Kit and Self Closing Faucet are available for these Pedestal Drinking Fountains. Wall Mount Drinking Fountains Are Popular For Use Indoors And Outdoors! 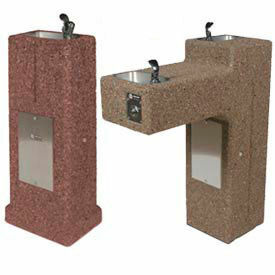 Concrete drinking fountains provide clean drinking water for any environment. Wall mount water fountains are made of pre-cast concrete with lead free components including stainless steel receptor, access doors and mounting brackets to provide weather proof and corrosion resistance thats great for outdoor applications. 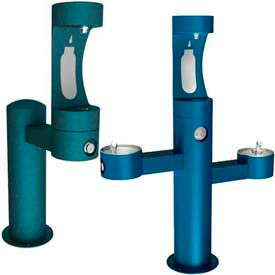 Drinking fountains include vandal resistant screws and double bubbler projector with chrome plated exposed fittings for theft protection and an attractive finish. Smooth, contoured basins with rounded corners and edges helps reduce splatter, ensure proper drainage and prevent standing waste water. 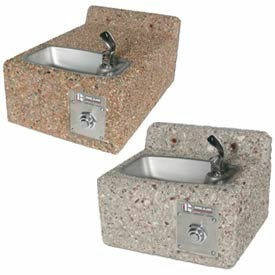 Concrete water fountains are easy-to-clean and have beveled edges and corners for safety. ADA Accessible Drinking Fountains without barriers are available. Freeze Resistant Drinking Fountains prevent frost or frozen water in colder climates. Features a freeze resistant valve system that installs behind a non-freezing wall for housing the water connection from the stop to the strainer. 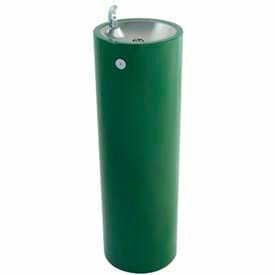 Acorn Pedestal Drinking Fountains Are Used For Schools, Amusement Parks, Outdoor Facilities And More. Acorn Pedestal Drinking Fountains are made of 14 & 18 Gauge Stainless Steel for long lasting durability. Lead-Free Stainless Steel & Brass anti-rotation non-squirt bubbler basin, front access panel and 100 mesh inlet strainer provide operational efficiency. Vandal resistant screws and screened louvers prevent tampering or theft. UPC AB1953, compliant; NSF, ANSI, ADA certified. Variety of models available. 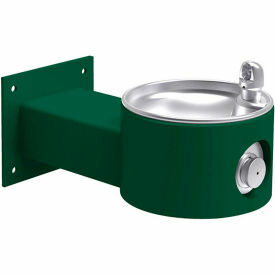 Halsey Taylor® Outdoor Drinking Fountains Are Perfect For Outdoor Use In Various Public Settings. Used for installation in public areas. Contour formed stainless steel basin with rounded corners and edges reduces splatter, provides proper drainage and prevents standing waste water. Self-closing assembly is located inside unit to prevent tampering. Unit resists corrosion and liming. Constant stream height is automatically maintained under line pressures that vary from 20 to 105 psi. Easily cleaned in-line strainer screen traps particles of 140 microns or larger before they enter the waterway. Endura™ & Endura II™ Fountains are made of cold rolled steel with a textured powder coat finish and E-Coat immersion process for year-round beauty with minimum maintenance and ultimate corrosion protection. Self closing, vandal-resistant pushbutton does not require grasping or twisting. 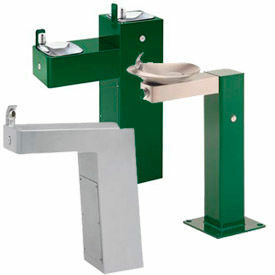 Haws® Barrier-Free Pedestal Drinking Fountains Are Used For Parks, Campuses, Playgrounds, And More. Made using heavy gauge galvanized steel with a powder coat finish. Water fountains feature a recessed push-button and welded bubbler guard. All bubblers are chrome-plated brass. Bubbler head features an integral basin shank. Vandal-resistant. 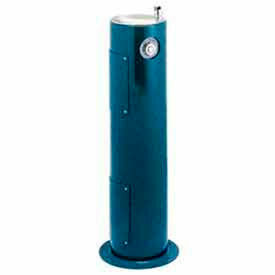 Water fountains are available in a variety of pedestal designs with stainless steel or green coloring. Available in single fountain units or Hi-Lo dual fountains for multiple simultaneous users. Tough Style Fountain features an EnviroGard™ bubbler head that provides sanitary service in the worst conditions. Stainless steel shroud covers orifice until the water is activated and covers it again afer use. StreetSmart™ Fountain is made using 12 gauge Type 304 stainless steel with integral 3/8 thick cast stainless bowls. ADA approved. ANSI/NSF compliant. Antique-Style Pedestal Drinking Fountains Meet ADA Standards For Accessible Design. Antique-Style Pedestal Drinking Fountains are made with a Victorian design. Some models have bi-level bowls to meet ADA requirements. Pedestal, arm, and pedestal are heavy duty iron, with heavy grade of oil-based black enamel finish to provide long lasting durability. Access covers are secured with vandal resistant stainless steel screws. Bowls have round, solid brass castings. Self-closing pushbutton activates internal mounted valve with adjustable stream regulator to control water flow. Bubbler is stainless steel and operates on a water pressure range of 30 - 105 PSIG. Pet fountain attaches to side. Installations are Floor or Floor/Wall. 1 or 2 stations. Some models are freeze resistant and ADA compliant. All solid brass castings conform to ASTM standards B61 and B62. This unit conforms to ANSI A117.1, 2010 ADA Standards for Accessible Design, ANSI/NSF 61-9, and Public Law 111-380. Dimensions vary. Wall Mount Drinking Fountains Are ADA And ANSI Certified For Public Areas, Parks, And More. Wall Mount Drinking Fountains can be used indoor or outdoor. Stainless steel and powder-coated exterior over a corrosion-resistant primary coating provide protection from the elements and long lasting durability. Available styles are Steel Wall Mount Barrier-Free Fountain, Outdoor Fountain Wall Mount/Non-Filtered Non-Refrigerated, and Steel Frost-Resistant Wall-Mount Barrier-Free Fountain. Halsey Taylor models feature Bubbler, Pushbutton Actuation Mechanism, Automatic Stream Height Regulator, Inlet Strainer and Drain Outlet. Widths are 14" and 16-1/4"
Depths are 19" and 14". Heights are 10-7/8 and 12-1/2. Used for outdoor educational campuses, recreational areas, office complex grounds, golf courses and parks. Durable tubular steel construction. Weather-resistant finish with corrosion protection internal and external coating. Outdoor models are non-filtered and non-refrigerated. Units feature vandal-resistant one-piece bubblers, heavy-duty steel water refilling stations with a 1 GPM fill rate, and some also include a pet fountain. Configurations vary by model. Each unit includes a vandal resistant pushbutton activation. Standard color finish is evergreen. Additional colors and freeze resistant units can be special ordered upon request.